I’m trying to get back on schedule with these bits and pieces. Puzzles: I love doing puzzles, and I think it keeps my brain sharp. Every afternoon, I do an online cryptogram, followed by an online crossword puzzle. The latter is timed, and your daily progress is in your score. I try to keep mine less than 7½ minutes, but sometimes I get bogged down, and the time gets raised. I love competing, even if it’s just with me! I used to follow that up with an online jigsaw puzzle, but something happened to my Adobe Shockwave and I couldn’t do the puzzle. I just learned, though, that it really wasn’t the program, but that they were redoing the site. In the meantime, I discovered another set of jigsaws, and I’ve been doing them. In the evening, I do the crossword and cryptogram in the newspaper. On Sundays, I do the online Sunday crossword by Merle Reagle, the regular crossword, and the cryptoquote. Then I do the newspaper NYT crossword, the Scrabble, and the small crossword. Each day I attempt the Sudoku, but I’m not good at the harder ones. I prefer words over numbers. I love my puzzles, and it’s good mental exercise. KP, With Pleasure: I keep thinking that I’m going to get tired of cooking and baking, but it’s something that I can do fairly independently, so I keep going. Today I’m baking some cookies -- some of them will be with green M and M’s for St. Paddy’s day. I think I’ll also make a syllabub, which is actually English, but since I’ll use Bailey’s, it’ll become Irish. It’s basically a whipped cream dessert with wine or other spirits. Cookies will go nicely with it. 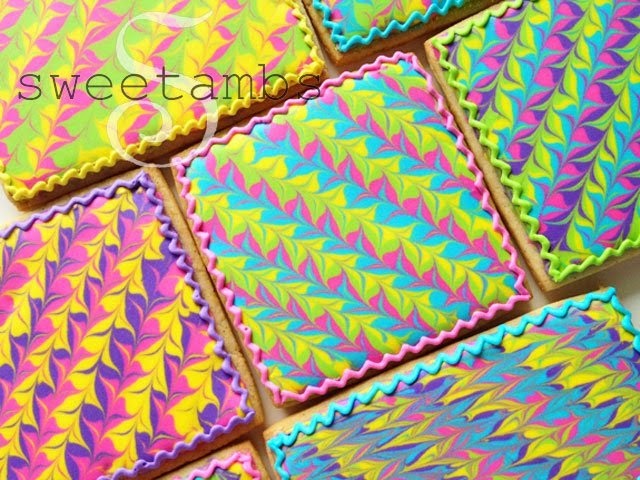 I really want to try making this marbled tile cookie that I found, but I’m not sure my hand is going to cooperate. If it works out, I’ll post it. If not – you’ll never know!! Spring Backsliding: Spring comes on the 20th – just a week away – and we were given a taste of it earlier this week. We’ll still keep the warmer temps, but we have rain headed our way. Then we may get colder weather and possibly a bit more snow. I hope that forecast is wrong and that we keep getting nice weather. I’m impatient for those days of light sweaters and no coats! St. Patty’s Day: I don’t decorate for this holiday, despite the fact that I’m of Irish descent. I just put a few pieces of Belleek and Waterford on my table, and I wear my Irish sweaters with plaid. I also try to make Irish foods for the day – and I’ll drink… tea. [wink, wink!] When I was a principal, I used to decorate my little entryway with all things Irish – dolls, shamrocks, crystal, etc. and I’d keep some Irish coffee hidden for my friends. It was fun! Books, TV: Nothing is new in this category. I will be asking my librarian if the county has Call the Midwife on DVD, and I’ll try to catch up with the past seasons. Soon, there will be all reruns of shows, so I’ll have time to catch up. That marbled tile cake looks like a pretty big puzzle in itself. i am addicted to sudoku puzzles, but if I had to time myself, I would have a nervous reakdown. I'm trying the tile today! Sudokus are my worst! Your post reminded me of online puzzles which I used to do long ago. I love search-a-words. I used to have a program to make my own which crashed with my old old computer. Love to hear your enthusiasm of cooking. There are so many online puzzles nowadays. I still like Scrabble, but you have to pay to play! Boo! Jigsaws are actually quite fun. Check out http://thejigsawpuzzles.com/ and see if you like it. i don't play any games or do any puzzles on line!! i don't "do" st. patrick's day either, i go right from valentine's day to easter!!! If I weren't Irish, I probably wouldn't celebrate the day either, but I am, so I do! I am usually occupied with either writing and/or ordinary life tasks. However, when I have a moment -- or NEED a moment -- I'll do Scrabble, Words with Friends, even solitaire. As for not decorating, it's a matter of perspective. What you consider minimal exceeds anything I do. In creating your former displays for your classroom, though, you must have been a joy for your students. Don't you have to pay to play Scrabble? I'm too cheap for that, although I love the game! I remember seeing St. Urho on your blog! I'll stick to just Patty! You must have a mathematical mind -- I just frustrate myself.